Several months ago I went to a yard sale and scored an old blue dresser for $15! I have been needing the extra storage space for table linens and wrapping paper for a long time now. I had no idea what color to paint it or where I'd put it for the longest time. It kinda floated around the house looking for a home. It landed happily in the living room, but as you will see it needed some major TLC. I had a vision and I finally got to work. I have been very inspired by one of my favorite blogs, Centsational Girl. She is amazing! I have been following her for a while now and I just love how she turns sad, lonely pieces into beautiful focal points. I love how she makes furniture POP. My first hurdle was to find a color that was pop-able against my pale green walls and that would down-play the loudness of my must-have-hot-pink-sofa. I have a table skirt that's a floral print with pinks, greens, browns, and darker yellows. I have lots of this fabric left over with the intentions of making a throw pillows, which never happened...in 7 years. BUT I haven't given up hope. They will be done...soon. I decided on the darkest shade of gold in the table skirt. It's called Yukon Gold and I love it. It definitely POPS! We roughed it up and primed it with 2 coats of KILZ white primer. When that cured, I painted 2 coats of the Yukon Gold. The pulls were gun-metal grey, which I didn't really mind, but they just didn't go with anything else. 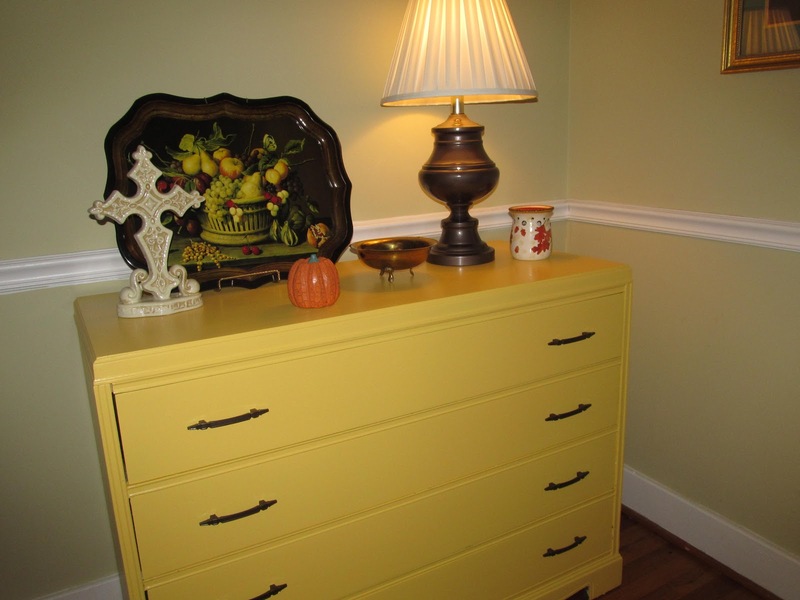 I used this great brown hammered spray paint by Rustoleum and gave them a face lift too. Any who! I was super pleased with the outcome for my first real re-do project. Thank goodness my momma is a re-do diva and was standing by to answer my ignorant questions. I had lots. I was so excited about getting started, I almost forgot to take pics. Yay me! My table linens and wrapping paper are all neatly tucked away now. I just love it. We had to move it to put the Christmas tree in the LR. So, for the time being, it is the display spot for my growing Nutcracker collection. The Centsational Girl would be proud! I lovin' the yellow!! Great transformation! Thanks for linking up to t2t Tuesday at Sassy Sites!